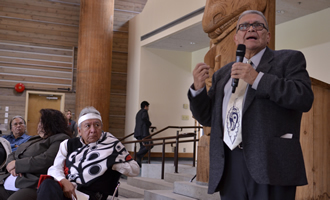 On November 1, 2011 the UBC First Nations House of Learning, in collaboration with the Indian Residential School Survivors Society, hosted a day-long event addressing the history and legacy of the Indian Residential Schools. For a description of this event and view a 30 min. video exploring some of its aspects, see UBC Dialogue: Nov 1, 2011. For a full and easily navigated video record of the event see UBC Dialogue: Full Video Record. For an introduction to the topic of the Indian Residential Schools, see Government Policy: The Residential School System.